MoMo 2.0: London Bro? London Bridge? Kan du huske den børns sang "London Bro falder ned.... ?" Jeg har sunget det siden jeg var en lille pige så jeg var spændt at "se London bro i personet". Dog har alle rejst til London vil fortælle dig.... London Bro er ikke broen at du vil gerne se! Can you remember the children´s song "London Bridge is falling down....?" I have sung this song ever since I was a little girl so I was so excited to "see London bridge in person." However everyone that has traveled to London will tell you.... London Bridge is not the bridge you want to go and see! TOWER BRIDGE ligner som en bro af et eventyr--det er så flot! Broen blev færdig i 1894 da det først oppe for skiber på Thames Å. Nu åbner det ca. 1000 gange hvert år. Du kan gå tværs broen og lære mange ting om dens konstruktion og historie. Så Mads og jeg gik tværs broen, så vi "Verdens Broer Exhibition" som fortæller om de fleste berømte broer i verden. Det var SÅ interresant og gav os mere idéer om steder at besøge! TOWER BRIDGE looks like a bridge from a fairy-tale--it is so beautiful! The bridge was completed in 1894 when it was first rasied up for ships on the Thames River. Now, it opens about 1000 times a year. You can walk across the bridge and learn all about its construction and history. As Mads and I walked across, we saw "The World´s Bridges Exhibition" which told about the most famous bridges in the world. It was SO interesting and gave us even more ideas about places to visit! Vi gik tværs Brooklyn Bro i 2007, Tower Bro i 2009.... hvad er næste på vores list?! We walked across the Brooklyn Bridge in 2007, Tower Bridge in 2009....what is next on our list?! 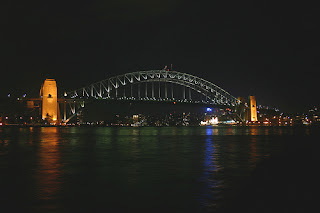 Sidney Harbor Bridge i Australia? 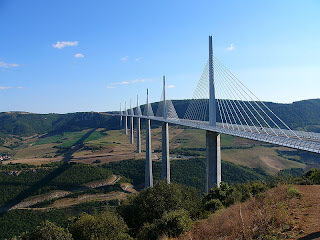 Ponte De Normandie i France? Golden Gate Bridge in San Francisco? Så mange flotte broer i verden....kan vi se alle? So many beautiful bridges in the world.... can we see them all? I vote for the Golden Gate!!!! YAY California! You and Mads may have looked silly. Golden Gate Bridge sounds good to me - although I have been there, I would gladly meet you & Mads there. It could be a wonderful time and we could take a side trip to the wine country! A dream for any Dane. 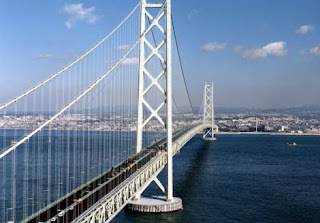 So, your life's aim is going to be visiting bridges now... Why not? 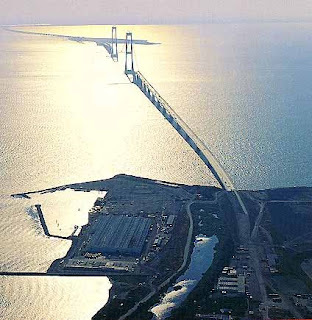 Have you gone over Öresunds Bridge that joins Denmark and Sweden? You sure can try! How about the Fredrikstad bridge? Our tour bus driver told us that some guy from Arizona bought "the london bridge" thinking he was getting the TOWER BRIDGE!! When he arrived in London to start "packing it up to send back to the US" he was sadly disappointed to see what he was really gettting...the real London bridge! Of course, now he denies it and said he MEANT to buy that one... but the tour bus guys in London are telling a different story! And LadyFi, I finally made it across Øresund Bro i March when we took Jess to her first Swedish IKEA shopping experience! Did you mention the Mackinac (pronounced Mackinaw) bridge? It's our one claim to fame here in Michigan. I'll ditto the Mackinac Bridge. Doug worked on the ferry boats during college summers. My grandparents met on Mackinac Island when they worked at The Grand Hotel during their college summers. It's a great place to visit. No cars allowed, only bikes. Mads would be right at home. 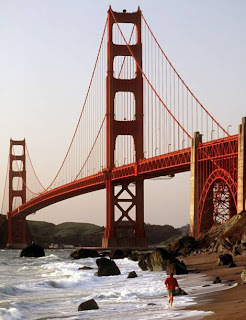 OHHH I think you should cross the Golden Gate and stay with us!